Looking Back | August and Labor Day Weekend 2017. Well hello Tuesday! I can’t quite believe it was a week ago that we arrived back home from Alaska. My mom got home yesterday afternoon, after almost four weeks away; spending a few extra days with us at both ends of the trip provided more opportunities for family gatherings … and recovering from the four-hour Alaska time difference and the red-eye flight home. For me the long weekend also gave me a chance to get started on the massive project that is sorting through 1,000+ photos and videos from our trip. I started with my August photo-a-day. 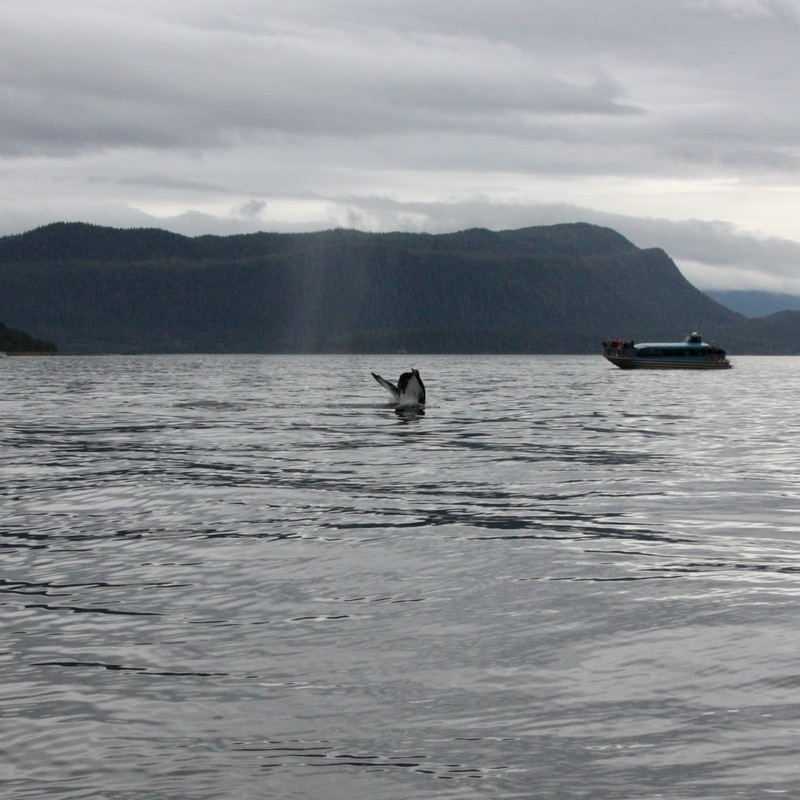 The first – from my summer bucket list – a whale near Juneau on August 20. And this one, from August 17. My sister and I knitted our mom the same matching hat & mitts set that we both made for ourselves; Karen knitted the hat and I knitted the mitts. We gave them to her the second night of the cruise when it was starting to get chilly. She certainly appreciated them, but she never wore them (we’re expecting she might have an opportunity – or two 😉 – this winter). I also have a quick peek at the past weekend. It was another whirlwind. Friday evening, we had a family gathering at Katie’s. Saturday, I took my mom to the Botanical Garden (her first daylight visit and my first full-on blue sky visit in a while). She’s planning to join when she moves and I know she’ll enjoy it as much as I have. Sunday, I finally made it down to the lake in the daylight and started a pair of socks for Charlie (which he insisted on modeling on his hand, not his foot). Yesterday, I spent the morning working on photos (that image I captured is from the Collect app) and in the afternoon I babysat the boys while Katie and Rob attended the (oh-so-disappointing) Georgia Tech home opener. I shared some of that fun on Instagram. …and just like that…it’s Tuesday! Hope you enjoyed your weekend and here’s to a great week! Always a pleasure to catch up with you and yours Mary! Can't wait to see more about your trip. Such fun pictures – especially like the one of your Mom with her hat and mitts! T'is a joy to see your photos and especially, the guys and Marmie! Welcome Home! Looking forward to more stories…and have fun with your 1K+ photos to sort,etc.